Zcash is a highly anticipated cryptocurrency that is expected to rival Bitcoin with its anonymous transactions. Many people will want to mine Zcash for its potentially explosive value as a fungible Bitcoin alternative, but what is the easiest way to mine it? Zcash uses a new mining algorithm, Equihash, which needs customized GPU software to mine. Most people don’t have the equipment or technical skill set to mine Zcash at home, but anyone can mine Zcash online. MiningRigRentals.com now supports Equihash for Zcash Mining Rentals! MiningRigRentals.com & NiceHash.com lets users rent mining rigs by the hour/day. Equihash is the algorithm needed to mine Zcash. If you don’t have a miner you can mine Zcash by renting someones equihash mining rig. If you have a Zcash mining rig, you can earn bitcoin by loaning it out. It is unlikely you will mine a Zcash block by solo mining, so before you buy some Equihash power you should join a mining pool. A mining pool lets users work together to mine Zcash blocks then share the reward. It is the most efficient way to mine most crypto currencies. Once you signup at a mining pool, create a pool worker. The worker name and password can be whatever you want. Save the Zcash mining pool and your worker to your account. 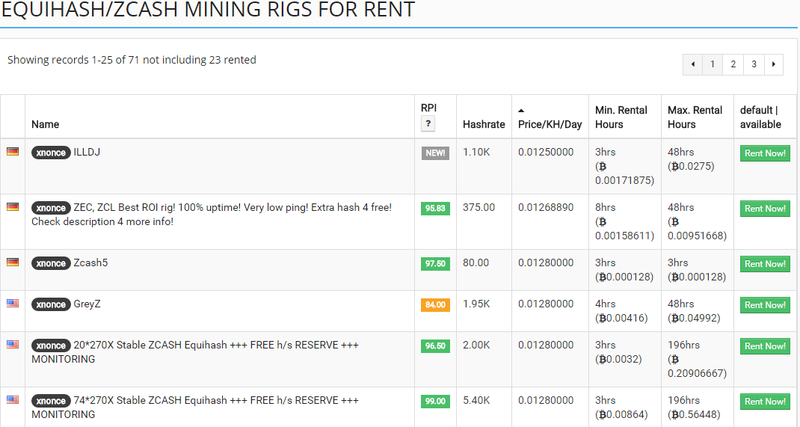 After you configured your worker and mining pool, place an order to rent Equihash mining rigs. If you did everything right you should be able to track your progress by watching your worker at the mining pool. You will be credited for your share of mined Zcash and it will be available to withdraw within 24 hours. You have to be very careful when researching companies for any cloud mining contracts. The vast majority of cloud mining operations are a total waste of money whether they are a scam, ponzi scheme, or just not profitable. There will likely be many new websites claiming to have the most profitable Zcash cloud mining but most will never be profitable. Buying ZEC directly is a better way to invest in Zcash. Warning: EVERYONE who bought these cloud mining contracts lost money! It is more cost efficient to buy some ZEC coins since the contracts payout very little Zcash.